Dwayne Lorenzo Bowe (born September 21, 1984) is an American football wide receiver who is a free agent. He played college football at LSU, and was drafted by the Kansas City Chiefs in the first round of the 2007 NFL Draft. Bowe ranks first in the Chiefs record books in receiving-yards-per-game (65.1) and second in receptions-per-game (4.7) after Tony Gonzalez. While playing for Louisiana State University. Bowe and his older brother Wayne were raised by their paternal grandparents, KW and Dorothy Williams in Miami, Florida. He was not involved in sports until his junior year in high school, when Bowe decided to join the high school football team at Miami Norland High School. In his very first game, he returned a kickoff 101 yards for a touchdown. Later, Bowe accepted an offer from Nick Saban to play for Louisiana State University on an athletic scholarship. Bowe played for the LSU Tigers football team while attending Louisiana State University. He ranks among LSU's all-time best wide receivers, holding the school's single-season record for touchdown receptions. Bowe appeared in 13 games as a backup for the Tiger's 2003 BCS national championship team. But it was his sophomore year at LSU that was his breakout season. After the departure of wide receivers Michael Clayton and Devery Henderson to the NFL, Bowe was poised to become a starter for the Tigers. In the opening game of the year versus Oregon State, Bowe caught a pass from Jamarcus Russell for a 38-yard TD strike that sent the game into overtime. The Tigers won that game, and Bowe finished second on the team in receiving yards while becoming one of Russell's favorite targets along with Skyler Green, Early Doucet, and Craig "Buster" Davis. 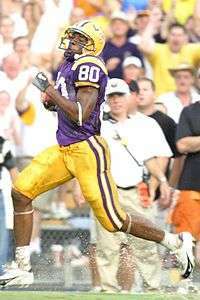 In his junior season (2005), Bowe led the team in receptions, averaging 17.3 yards per catch and setting an LSU record by catching a TD pass in seven straight games. Bowe caught the game winner versus Alabama that year, giving LSU a 16–13 OT win in Tuscaloosa. Bowe's senior season (2006) was his best yet. Not only did he lead the team in receptions (65 receptions for 990 yards), he also set another LSU school record with 12 touchdown catches on the year. Bowe led a trio of receivers including Doucet and Davis that combined for 180 catches, 2,598 yards, and 24 TDs. Regarded as one of the top wide receivers available in the 2007 NFL Draft, Bowe drew comparisons to Hines Ward. He was selected 23rd overall by the Kansas City Chiefs. Alongside his former teammates JaMarcus Russell and Craig Davis, the trio became the first quarterback/wide receiving group to be selected in the first round of the draft. Bowe scored on a pass from Damon Huard in the first half of the Chiefs' game against the Chicago Bears on September 16, 2007. In his rookie season, Bowe led all first-year receivers in receptions (70), yards (995), and touchdowns (6). His reception and yardage totals set franchise records for Chiefs' rookie receivers. Bowe also set the team's single-game rookie receiving record with 164 yards against the San Diego Chargers on September 30, 2007. Bowe was in contention for the Rookie of the Year Award for his performance in 2007 (the award was eventually given to Minnesota Vikings halfback Adrian Peterson). In the Chiefs first game of the 2008 season, Bowe recorded five receptions for eighty–nine yards, but he also dropped 4 passes, including a game–winning catch in the endzone on first and goal. He went on to obtain 1,022 yards receiving and ended the season 4th in the NFL with 86 receptions. In his last game of the 2008 season Bowe gained 103 yards with 10 receptions. Playing with new quarterback Matt Cassel, Bowe finished the season with 589 receiving yards and 4 touchdowns in 11 games. On November 17, 2009, Bowe was suspended for 4 games for violation of the NFL's substance abuse policy, after he tested positive for a diuretic. Bowe got off to a slow start in Chiefs' 2010 campaign, catching only 9 passes in the team's first 4 games. In the Chiefs' fourth game against the Indianapolis Colts, Bowe dropped crucial passes including one in the endzone which would have given them the lead, as the Chiefs' got their first loss 9-19. On October 17, 2010, Bowe caught 6 passes for 108 yards and 2 touchdowns against the Houston Texans in a game that the Chiefs lost 31-35. The following week was prolific for Bowe once again, as he hauled in 3 receptions for 81 yards and 2 TD's in a 42-20 win over the Jacksonville Jaguars. In Week 8 against the Buffalo Bills he caught 3 passes for only 16 yards but again found the endzone, helping his team win against the Buffalo Bills, 13-10. In Week 9's match-up with the Oakland Raiders he caught 5 passes for 63 yards, adding another touchdown as well. The Chiefs went on to lose the game in overtime, 20-23. On November 14, 2010, almost a year after his drug suspension, Bowe set new career-highs for receptions and receiving yards in a single game versus the Denver Broncos. As the Broncos took a 35-0 lead, the Chiefs were forced to air it out. Bowe was targeted 18 times and caught 13 passes for 186 yards. He had 2 touchdowns as well. That was Bowe's fifth straight game with a touchdown reception. The Chiefs lost the game, 29-49. In Week 11, against the struggling Arizona Cardinals Bowe extended his streak to six straight games with a touchdown, this time coming up with 2. That set a team record for most games with a TD catch. He finished the game with 6 receptions for 109 yards and helped his team en route to a 31-13 win. The following week, in the first half against the Seattle Seahawks Bowe caught 8 passes while gaining 120 yards. Two of the receptions went for touchdowns. In the second half he added five more receptions, including his third touchdown of the game. He extended his streak to 7 straight games with a score, thus breaking the Kansas City Chiefs franchise record of 6 straight games with a touchdown. Bowe also broke the Chiefs' franchise record for most touchdowns in a single season during the game against the Seattle Seahawks in week 12. He was invited to the 2011 Pro Bowl. He finished the 2011 season with 81 receptions, 1,159 receiving yards and 5 receiving touchdowns. On March 5, 2012, the Chiefs placed a non-exclusive franchise tag on Bowe. On August 17, Bowe signed a 1 year, $9.5 million tender, ending a lengthy holdout. In Week 14, Bowe injured his ribs while making a block, and on December 14, the Chiefs placed Bowe on injured reserve. On March 4, 2013, Bowe signed a five-year contract. Ian Rapoport of NFL.com reported that Bowe became the NFL's third highest-paid wide receiver in terms of total compensation on his contract. His deal was for $56 million over five years and included $26 million in guaranteed money plus a $15 million signing bonus, according to someone who had seen the deal. In year one, Bowe earned $16 million with a base salary of $750,000 and a workout bonus of $250,000. In the first three years, Bowe would have earned $36 million. The Chiefs released Bowe on March 12, 2015. Bowe in the premiere showing of the Browns' new jerseys. Although Browns general manager Ray Farmer signed Bowe during the offseason, head coach Mike Pettine chose not to use him throughout the season, saying he was not among the top four receivers on the team. 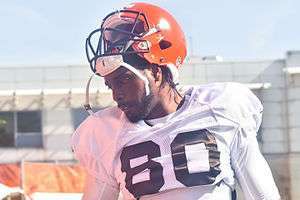 Bowe made his Browns debut during a Week 2 matchup against the Tennessee Titans but was held without a catch. He did not make a reception until Week 9 at the Cincinnati Bengals. He finished the game with a season-high 3 catches for 31 yards. During his first season with the Browns, Bowe appeared in only 7 contests, had 5 catches, and no starts. Throughout the season he was deactivated for most games and the fourth or fifth receiver on the depth chart behind Travis Benjamin, Brian Hartline, Taylor Gabriel, and Andrew Hawkins. ↑ Wachtel, Kyle. "Dwayne Bowe Resigns With Chiefs". ForensicFantasy.com. Retrieved 15 April 2013. ↑ Rang, Rob (April 19, 2007). "NFL Prospects: Wide Receivers and Tight Ends". CSTV.com. 1 2 "Pro Football War Room: Dwayne Bowe". SportingNews.com. April 29, 2007. ↑ Chiefs' top pick Bowe ends holdout ESPN.com, 5 August 2007. 1 2 Whitlock, Jason. "Blame Bowe and Carl for this loss". The Kansas City Star. Archived from the original on September 15, 2008. Retrieved 2008-09-10. ↑ "Chiefs beat deadline to apply franchise tag to WR Bowe". NFL.com. ↑ Dwayne Bowe signs tender, returns to Chiefs-NFL.com Retrieved 17 August 2012. ↑ Skretta, Dave (2012-12-15). "Chiefs put WR Dwayne Bowe on injured reserve". Yahoo! Sports. Retrieved 2012-12-15. ↑ "Dwayne Bowe signs contract with Kansas City Chiefs". NFL.com. ↑ Pekarsky, Michelle (2013-11-12). "Chiefs' wide receiver Dwayne Bowe arrested for speeding, possession". FOX 4 Kansas City. Retrieved 2013-11-12. ↑ Hanzus, Dan (March 12, 2015). "Dwayne Bowe released by Kansas City Chiefs". NFL.com. Retrieved 2015-08-08. 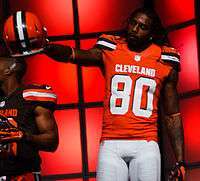 ↑ "Mike Pettine:Dwayne Bowe not among Brown's top 4 receivers". Retrieved October 21, 2015. ↑ NFL.com. "NFL Player Profile:Dwayne Bowe". Retrieved December 16, 2015. ↑ "Cleveland Browns release receiver Dwayne Bowe". NFL.com. Retrieved 2016-03-16. ↑ "Dwayne Bowe Stats". ESPN Internet Ventures. Retrieved 30 January 2014.